The outcome of the above application was wrongly stated at the last CBCC meeting, as the Planning Representative was informed by a neighbour that the application was approved just seconds before the start of the meeting. In fact, the neighbour had seen the Handling Report, not the Development Management Sub-Committee’s decision of the day before the CBCC meeting. Our Councillors had sought a hearing on the application at the Sub-Committee’s meeting and although this request was rejected, it triggered a discussion which eventually led to the application being refused on grounds of access of the house nearest to Queensferry Road being too near the junction of Cammo Road and Queensferry Road and the design of the end gable. While this application was refused, the Sub-Committee did not challenge the principles of replacing the traditional villa with townhouses and it is likely that a revised application will be forthcoming, which may well be approved. Following the exhibition of plans and discussion at CBCC’s May meeting, the Community Council sought agreement, initially informally and then formally, by Council officers to defer consideration of the planning application until the items identified below have been resolved. This request was turned down and CBCC has lodged its formal submission seeking refusal of the application, or the use of suspensive conditions, to ensure that deficiencies in the application and issues about design, drainage, traffic, etc. are resolved to the satisfaction of the City Council, Community Council and local communities, prior to any planning proposals being approved. The project has been a long time in development, due to the search for funding, detailed design of orientation and interpretation materials, contracting design and interpretation consultants, etc. 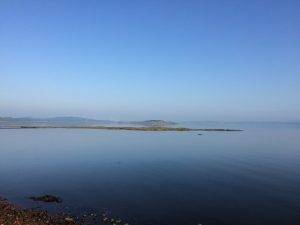 The project is the product of a very successful collaboration between CBCC, Cramond Association and Friends of the River Almond Walkway, with support from Cramond Heritage Trust and the City Council. Funding has been sourced from Edinburgh Airport, Neighbourhood Partnership, Historic Environment Scotland, Sir Tom Farmer Foundation, Sir James Miller (Edinburgh) Trust and the partner organisations. While pleased to see the completion of repairs to the Weir and the replacement fish-pass, CBCC has reported its concerns to the City Council, Riverlife and SEPA over the considerable quantities of stone left in the riverbed. This stone was washed into the main stream of the river from the temporary causeway and storage area following floods earlier in the year and has become very obvious during recent low river flows. Despite our best efforts to keep residents informed about the planned roadworks and consequential changes to bus routes we have been thwarted by a late dispute between Scottish Power and the contractor selected to carry out the works. The CC has been told that the work will commence on Thursday 21 June and with it the temporary changes to the route of the city bound 41 bus service. Many may see this temporary route as one we would wish to see formally adopted by Lothian Buses and a mandate for the CC to seek such an adaptation will be sought at the meeting on 21 June. The CC’s Barnton Junction paper was considered by the North West Localities Committee at its meeting in the City Chambers on 19 June and a deputation comprising your new and re-invigorated Chair, Andrew Mather and your Secretary made a presentation and answered various questions. The key things to take out of this is that the Committee is well sighted on the issue, on our proposals, on their provenance and we have their assurances of the requirement for officials to give due consideration to the contents and there is commitment from officials to deliver on a number of these – some sooner than others. There is also to be a Strategic Transport Review focussing on the A90 Queensferry Road corridor. An appetite to work with transport providers to secure better public transport links especially from the north (and to consider measures designed to help flows). Note the Council website has in recent days included information on the proposed charging for the brown bins garden refuse collection. Couched in terms suggestive of a welcome new service the info is light on the issue this CC has raised in the past – that of buildings of multiple-ownership with shared gardens. The Council is in danger of repeating the same mistakes it made when it abrogated responsibility for “enforcing common repairs” which has compromised the structural integrity and safety of several properties in Edinburgh.